Mix well milk, rice flour, sugar, 1/2 tsp desi ghee, saffron & elaichi powder. Switch on the gas. 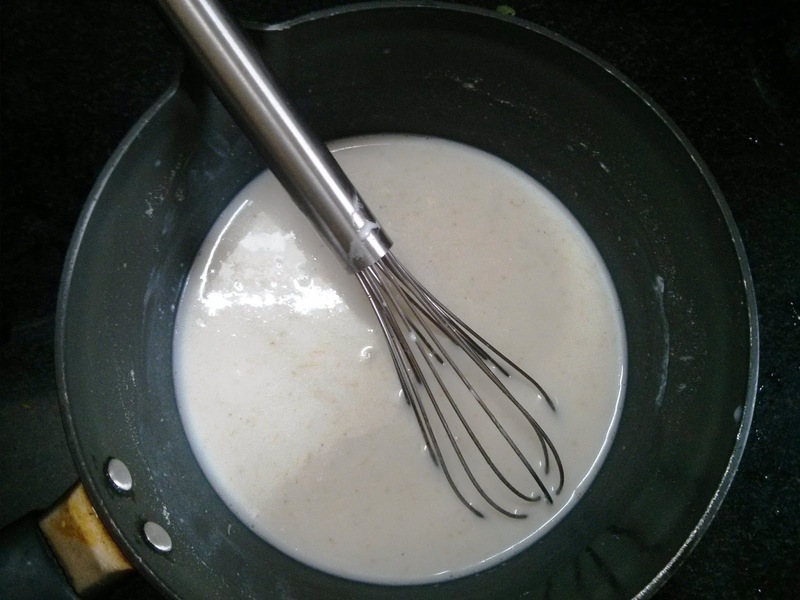 Stir the mixture continuously till it thickens without lump & cooked properly. Turn off the gas.. Transfer the mixture in a greased baking tin. ( grease it with desi ghee). 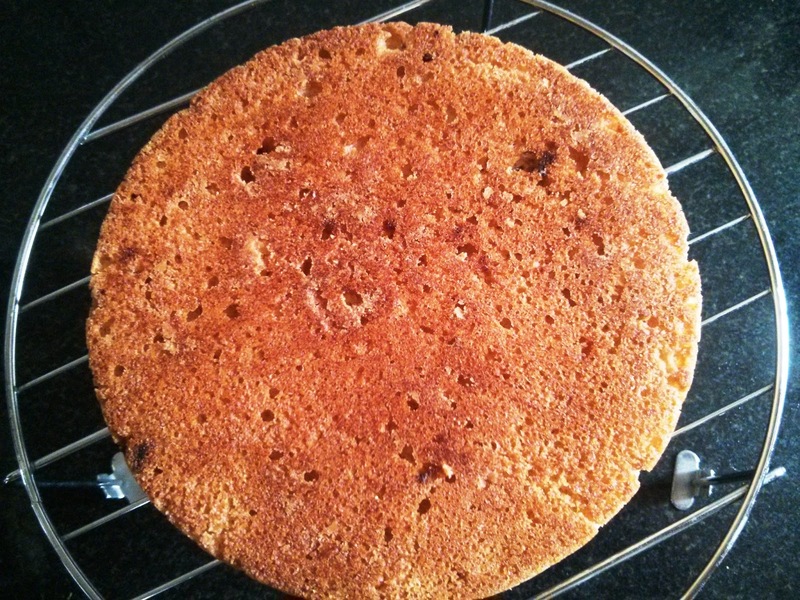 Decorate it with almond slices. Bake in the oven at 200c for 10 minutes. Cut into slices as you like & enjoy this creamy & delicious pudding !!! Sugar : 1/2 cup or as per taste. 1. 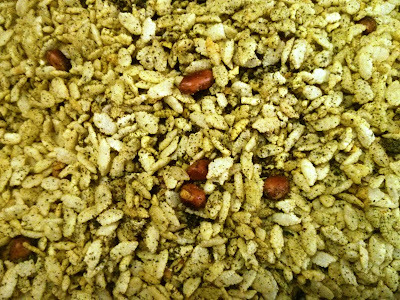 Mix all ingredients except sliced almonds in a heavy bottom pan. Save 1/2 tsp desi ghee for greasing the tin. 2. Switch on the gas stove & start cooking the mixture on medium flame. 3. Stir the mixture continuously so that it will not form lumps.When it thickens completely turn off the gas stove. It will take 5-7 minutes. 4. Transfer the thickened mixture in greased tin. 5. Bake for 10 minutes in the oven at 200c. You can bake it directly on non stick pan. You can eat this pudding without baking. Keep it in freeze for 3-4 hours & enjoy chilled !! Do try this very easy & delicious recipe. It takes only 20-30 minutes to prepare. For flavour vanilla or rose essence can be used. 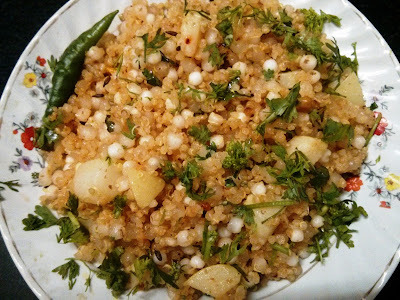 Very Healthy flavourful Chivda , good for evening snack !!! 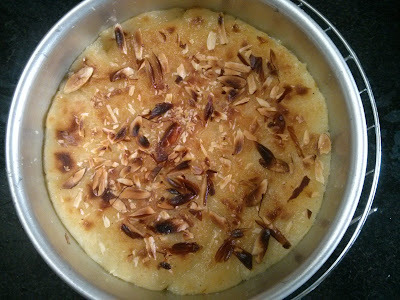 ( Bhajke Pohe ) It is easily available in the market. 1. Heat a heavy bottom pan on gas stove. 2. Add curry leaves & 1/2 tsp oil. 3. Stir properly till it becomes crispy. Keep it aside. 4. Then add chopped coriander, mint leaves & red chillis in the same pan. 5. Again add 1/2 tsp oil & make it crispy. Let it cool. 6. Grind crispy curry leaves, chopped coriander, mint leaves & red chillies alongwith sugar & salt to a fine powder. Keep aside. 7. In the same pan heat remaining oil. 8. Add hing . Add lemon juice. 9. Immediately add roasted peanutes & ground powder. Mix properly. 10.Add bhajke pohe & mix well. 11.Store in a airtight glass container. Enjoy this light green healthy snack with hot tea!!! 1. Cut raw mango into small pieces. 2. Heat oil in heavy bottom vessel or kadhai. 4. When mustard seeds crackle add fenugreek seeds, turmeric powder & hing. 5. Add red chilli powder & salt. 6. Saute for 1 minute & add raw mango pieces in the masala. 7. Turn off the gas. 8. Let the pickle cool down..
9. Store in a airtight glass container. 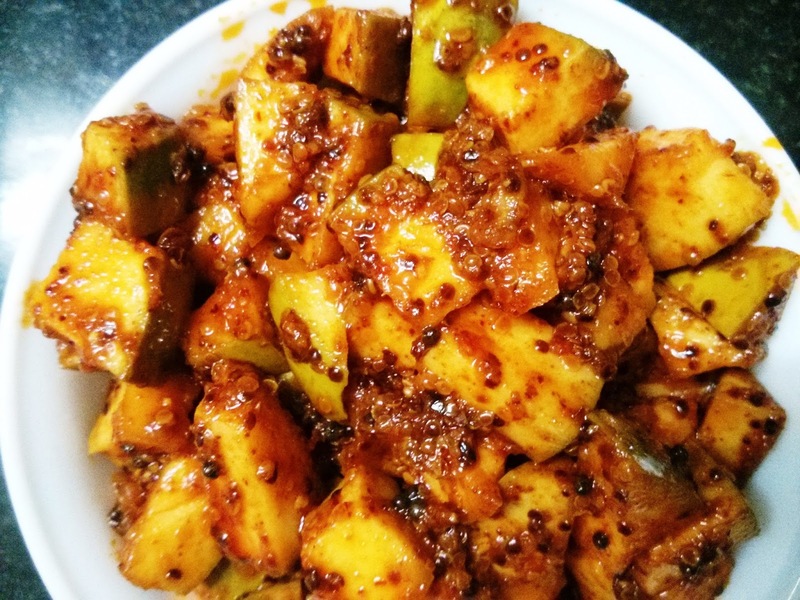 10.Enjoy this mouth watering pickle with phulka or rice. Keep the pickle in refrigerator as it does not last long. 1. Take milk powder in a bowl. Add warm milk into it & prepare a smooth paste out of it. 2. Heat 2 tsp desi ghee in a big microwavable bowl. 3. Add mango pulp, sugar & milk powder paste in the bowl. 4. Mix all properly & keep the bowl in microwave oven for 3 minutes without covering. Mixture will be thick by this time. 5. Add roasted poppy seeds, elaichi powder, saffron strands, almond powder & mix properly. 6. Again microwave for 1 minute. 7. Still mixture is not thick again microwave for a minute. 7. Knead it till it becomes smooth. Keep aside. 9. 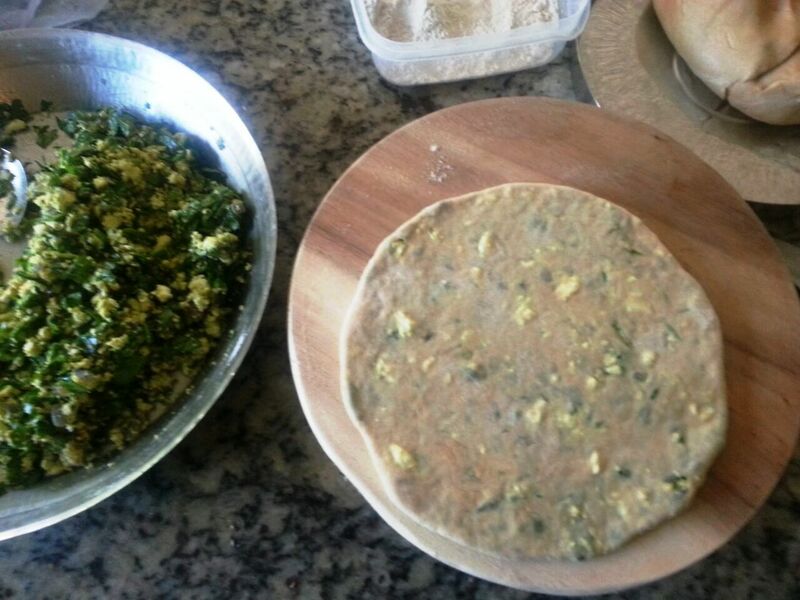 Prepare a nice smooth dough of ata by adding salt water & oil. 10.Take a small ball of ata . Prepare small roti out of it. Not very thin. 11. Prepare a mango mixture ball to fill in .Take as much as mango mixture to fill in the roti. 12.Prepare a roti & roast both sides to light brown colour on non stick pan by adding little ghee. Enjoy this heavenly mango poli with ghee!! 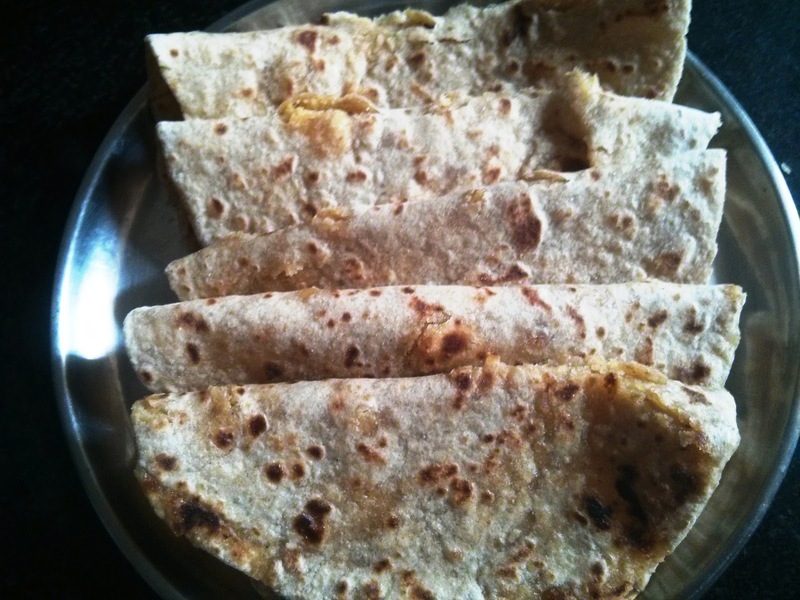 This is very easy recipe which tastes close to puranpoli. The new cooks can give first attempt to this recipe before trying puranpoli!! 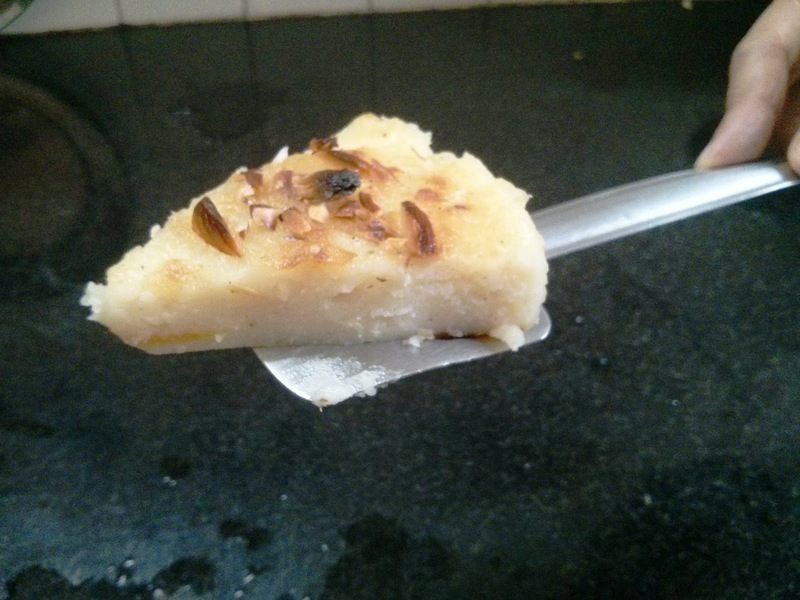 Save 2 tsp ghee to roast the besan poli. 1. 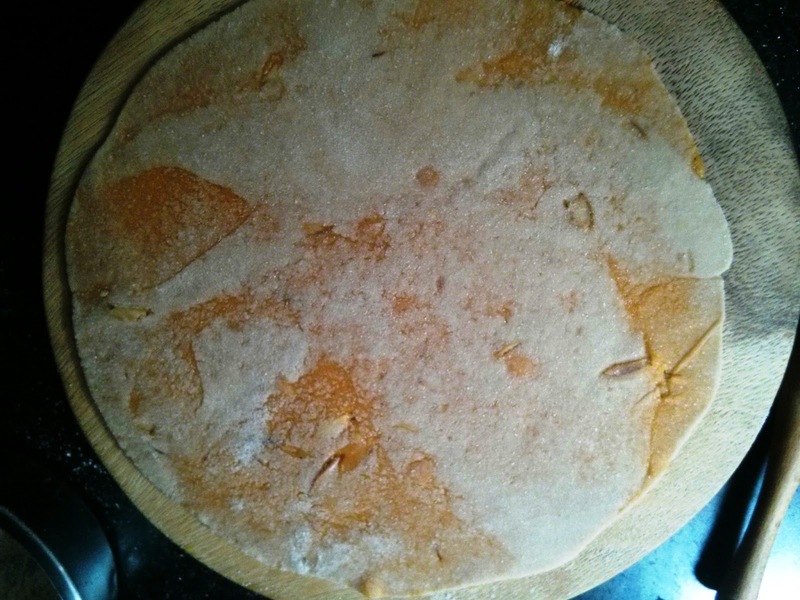 Heat desi ghee in a heavy bottom pan. 2. Add besan into the ghee and roast it till it becomes nice brown. 3. Boil milk & water together simultaneously on another gas stove. 5. When basan is cooked and all the water is evaporated add sugar & roasted poppy seeds, mix well and again cover it for 3 minutes. 6. It will be like sheera or besan halva. 11. Prepare a besan ball to fill in .Take as much as besan sheera to fill in the roti. 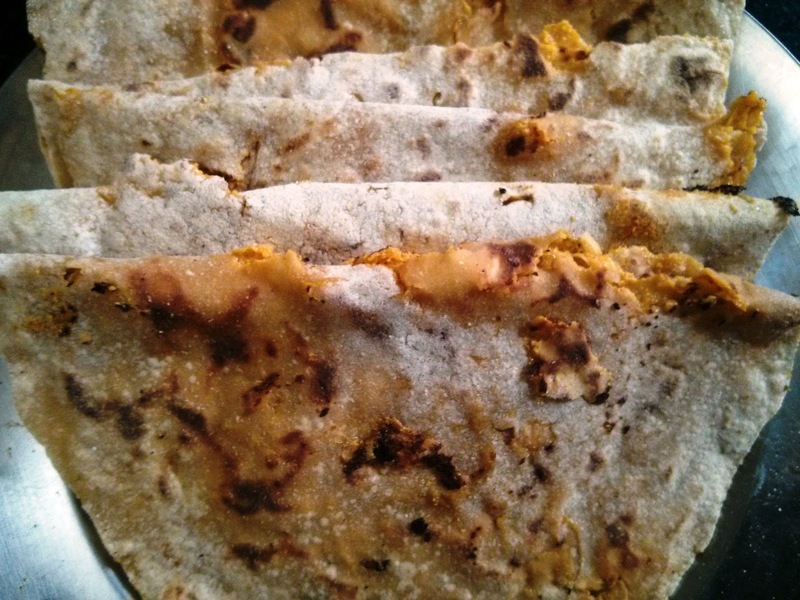 12.Prepare a besan poli & roast both sides to light brown colour on non stick pan by adding little ghee. Enjoy this delicious Besan poli with ghee!! Very healthy Palak & Paneer Paratha !!! 1. Mix properly all the ingredients for filling & keep aside. 2. Prepare a nice smooth dough of ata by adding salt & oil. 3. Let it rest for about an hour. 5. Take double amount of palak & paneer mixture & fill in ata cup. 6. Roast it to nice brown colour on heavy griddle by adding little oil on it. 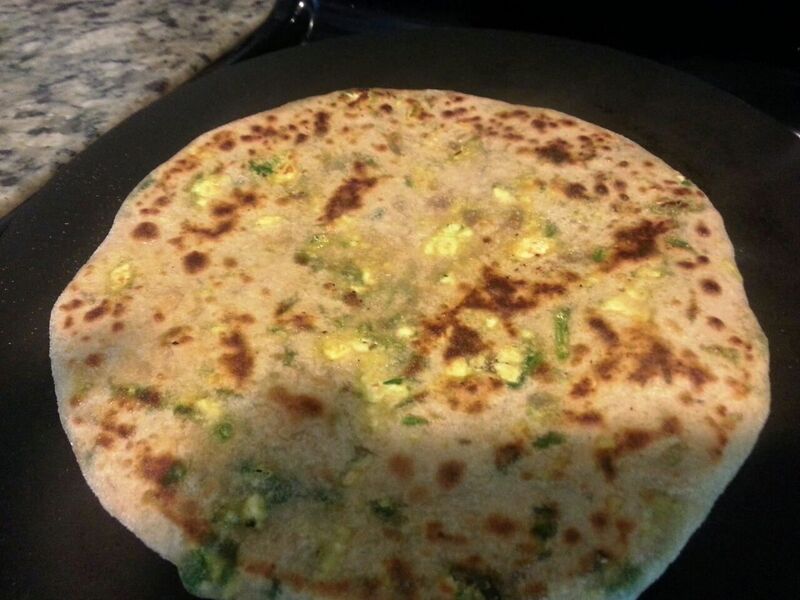 Enjoy this tasty & healthy paratha with pickle, chutney or with yoghurt !!! This is very easy & enjoyable sweet,sour & chatpata pickle !!! 1. Peel the green mango & cut into small pieces. 5. Add mango pieces & saute for some time. 6. Add 2 tsp water & salt. Cover with lid for 2 minutes. 7. Mango pieces will be soft. 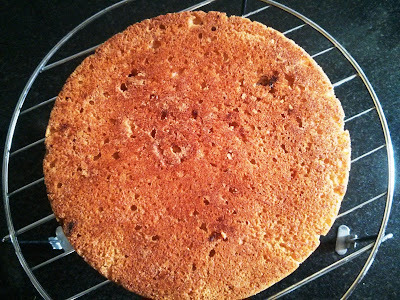 Add jaggery & again cover for 2 minutes or till jaggery melts. 8. Turn off the gas. 9. When mixture becomes cool add red chilli powder & cumin powder. 10.Mix properly & keep in glass container. 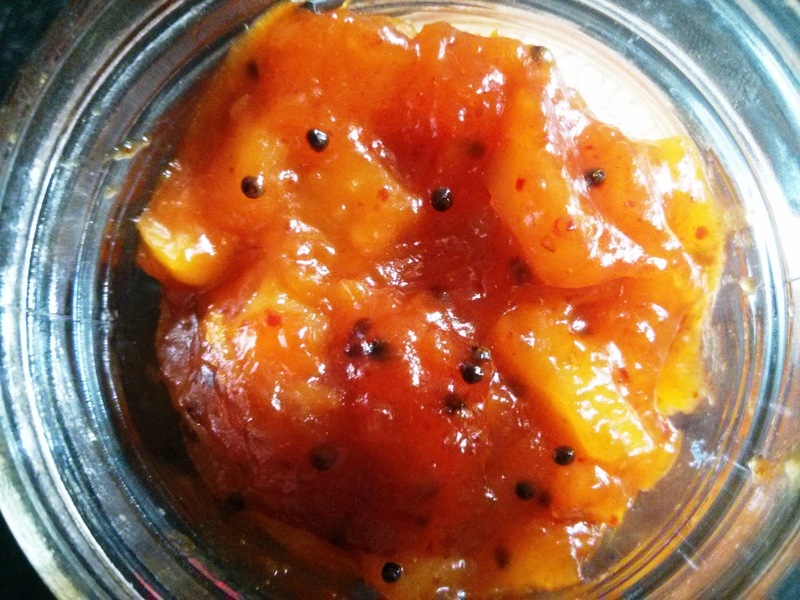 11.Enjoy this sweet, hot & sour pickle with paratha or phulka. Pl note this pickle does not last long. 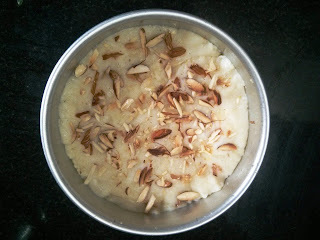 Keep in fridge upto 8 days. We can have rich amount of proteins along with carbohydrates in this balanced Khichadi !!! Enjoy this healthy & tasty recipe! 1. Soak sabudana for 4 hours in a bowl. 2. Soak Quinoa for 2 hours in a different bowl. 3. Pressure cook Quinoa for 2 whistles. 4. Let it cool completely. Quinoa should not be sticky. 5. Mix sabudana, cooked quinoa, sugar, salt, peanut powder, fresh grated coconut & coriander in a big bowl. Save some coconut & coriander for garnishing. 7. Add cumin seeds & fry for few seconds. 8. Add boiled potato & saute for 2 minutes. 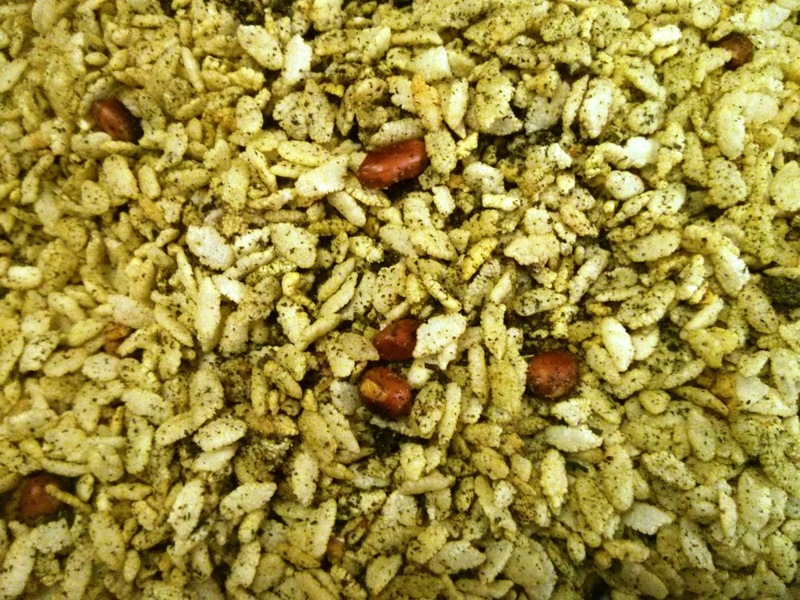 10.Add sabudana & Quinoa mixture. 11.Mix properly. Saute for some time. 12.Cook for 5 minutes keeping lid on the kadhai. Mix again. 13.Garnish with fresh coconut & chopped coriander. 14.Serve with plain yoghurt this tasty recipe. 1. Add dry yeast & sugar in bowl. 2. Mix water 1/4 cup of luke warm water with sugar & yeast. 3. Keep aside for 15 minutes. 5. Take suji , maida, salt, mixed herbs, garlic & olive oil in a large bowl. 6. Mix properly & add mixture of yeast in it. 7. Prepare a soft dough with warm water & cover the bowl with plastic wrap or lid. Let it rest for 2 hours. 8. After 2 hours the dough will be double of original size. 9. Add this dough in a greased tin & again keep for 15 minutes. 10.Preheat the cooker with stand on medium flame for 5 minutes without whistle. 11.Keep the greased tin in on the stand & bake the bread for 30 minutes. First 10 min. on medium flame & then on low flame. 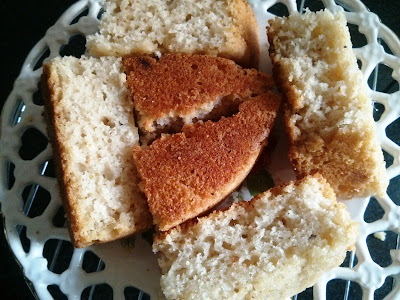 Enjoy the bread in breakfast or as evening snack.